Bruno Mathsson (1907-1988) developed modernism in furniture design and architecture, addressing both general and special problems in the design of furniture, interiors and buildings. The furniture designer is well known, but the architect will be a new acquaintance to most people. Iit is 70 years since Bruno Mathsson had his first separate exhibition at the RoehssMuseum of Design and Crafts in Gothenburg (Göteborg). Mathsson’s furniture caught both European and American eyes followingits international breakthrough at the 1937 International Exposition in Paris. One of the first commissions came from the Museum of Modern Art, New York, which needed furniture for the public rooms in its new extension. He always viewed his individual furniture designs in a broader context –that of interaction with the room and with architecture. The living room of his own weekend cottage at Frösakull –shown in the exhibition as a full-scale model – is a précis of his ideas onhousing and furnishing. Mathsson’s ideal room has large expanses of glazing, so as to make the landscape outside part of the dwelling environment. His slender, organic furniture shapes interact with nature. As a designer and architect he was self-taught, in that his learning and ideas came from books and periodicals. The links between design and nature – ergonomic solutions, spatial thinking and architecture – were self-evident. Bruno Mathsson’s ideas and his development of “ultimate sitting” were motive forces of his furniture design, reflected in both sitting curves and table heights. He also took an interest in designing the workplaces of tomorrow, his thesis being that people in office environments would work more comfortably and think more efficiently in positions of repose. 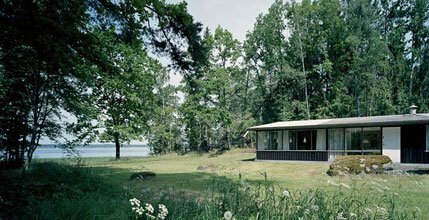 In 1948 Bruno Mathsson and his wife Karin Mathsson made a journey to USA where they met many of the architects and designers he had read about: Frank Lloyd Right, Eliel and Eero Saarinen, Charles and Ray Eames amongst others. International and, in particular, American discussion of housing during the 1930s and 1940s inspired Bruno Mathsson to address the conditions of future living. Bruno Mathsson designed a large number of single-family dwellings, terrace houses, schools, crèches, factories and exhibition galleries. His theme was brightly lit, airy structures with large expanses of glazing, built to a rational modular system. Some 50 houses of his were built in Sweden and abroad. The interest for Bruno Mathsson’s design was renewd due to his succes at the exhbition Interbau in Berlin 1957. In the 60:s Bruno Mathsson created the chairs ”Jetson”, ”Karin”, ”Ingrid”, the bed ”Ulla” and, together with Piet Hein, the superellips table. The exhibition will take place until the 27th of August, 2006.